"You feel like you're in a galaxy far, far away." Visiting other planets without leaving our planet. 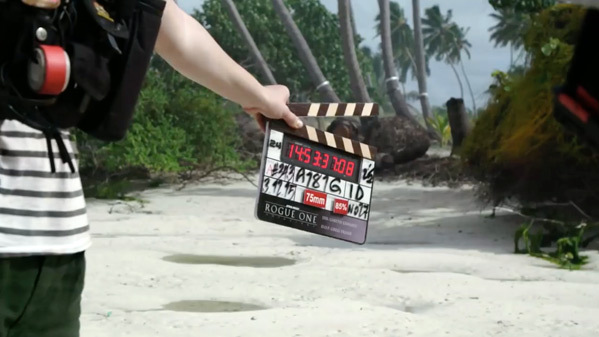 Lucasfilm + Disney have revealed one more making of featurette for Rogue One: A Star Wars Story, which is now playing in theaters nationwide. The video includes some discussions with director Gareth Edwards and star Felicity Jones talking about filming on location. They profile locations in the United Kingdom (where most of the sets are built) as well as Iceland, Maldives, and Jordan. If you've seen the movie, you should be able to recognize all of these places. It's fascinating to see them turn these locations on Earth into exotic planets around the Star Wars galaxy. The spectacular magic of making movies. Now I want to see this again. Rewatch the first teaser for Rogue One here, plus the second or third trailer / behind-the-scenes featurette. "Rogue One takes place before the events of Star Wars: A New Hope and will be a departure from the saga films but have elements that are familiar to the Star Wars universe," says Kathleen Kennedy. Rogue One tells the story of resistance fighters who have united to steal plans to the dreaded Death Star. It's being directed by English filmmaker Gareth Edwards, of the movies Monsters and Godzilla previously. The screenplay is credited to Chris Weitz (About a Boy, The Golden Compass, Cinderella) based on a story by John Knoll and Gary Whitta. Disney will release Gareth Edwards' Rogue One: A Star Wars Story in theaters everywhere starting December 16th, 2016 - now playing in cinemas worldwide. Your favorite locations? Not really...many of the worlds have diverse ecosystems. Worlds like Naboo, Endor, and Alderaan to name a few. Endor is a "forest moon"....the whole thing is a forest. Naboo and Alderaan are basically Switzerland/North Italy. Wrong on all three counts. Just google the planets and the images clearly show diverse environments. Thats like saying Earth must only be covered in snow because thats all we see in The Thing.